OptiCall’s annual Medical Marketing Outlook analyzes data from over 1 million patient phone calls and web leads to determine the most effective ways medical practices are attracting and converting more prospects to booked appointments. Our comprehensive report evaluates traditional and emerging marketing channels from 2018, and compares them to performance in previous years to reveal key trends. The results can empower your practice with strategies for a successful year ahead. Although Word of Mouth referrals are still the single most powerful way to get qualified leads who end up booking a consult, they had the greatest change in 2018 with a decline of an astonishing -8.51%. Interestingly enough, the decrease in referrals is about the same as the increase in Internet leads. Based on last year’s predictions that mobile would shift communication, we believe this is data-driven proof consumers are turning to their mobile phone as a trusted source of information. 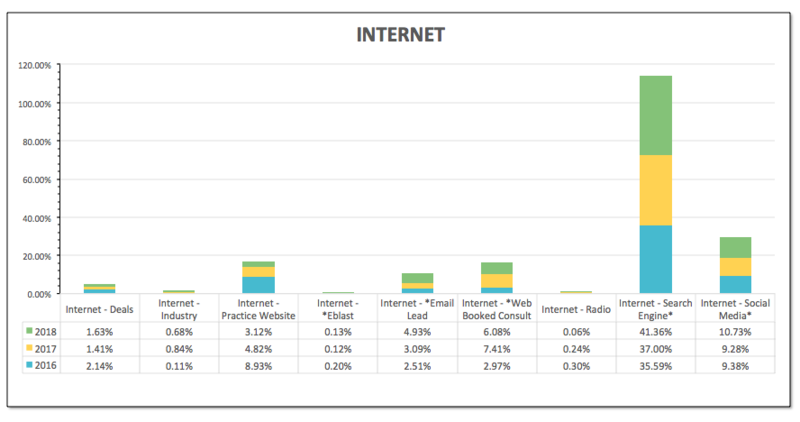 The entire Internet category contributed to roughly 1/3 of leads. The strongest subset, Internet Search has been rising in recent years, and in 2018 jumped to over 41%. Internet search is by no means a new thing. For 20 years, it has been a source to answer questions and gain insights, yet today, the words that people type into a search box have become increasingly conversational and personal. And it’s no longer the age of information. It’s the age of assistance. With consumer expectations increasing, brands will need to anticipate needs and provide information that helps them in their buyer journey. However, a consumer’s ability to “click to call” so easily from search results on a mobile device means prospects may bypass your website and want to get in touch with you directly. Nearly half of mobile searchers indicated not having a call option would cause them to be frustrated and likely to turn to a competitor. 2.) Your marketing strategy needs to be optimized for mobile. 3.) It’s the age of assistance and that takes many forms. Prospects may look to the internet to find answers to their questions, but many still want to talk to a person. Practices need to cater to both. 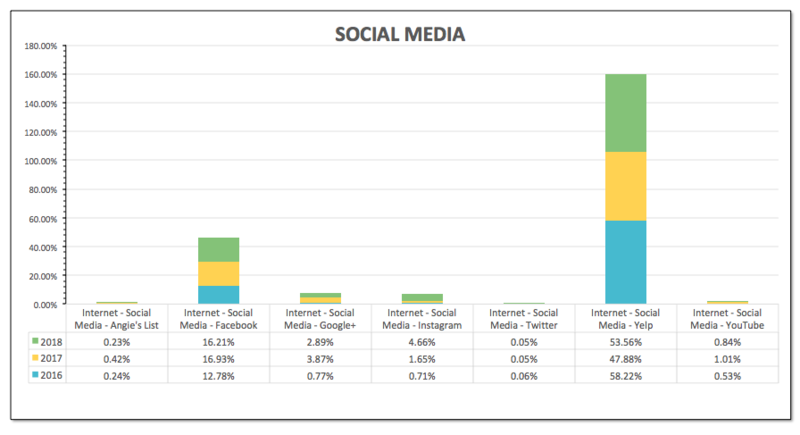 Social Media overall also increased in volume this year, making up over 10% of Internet leads. Over the years, Yelp has consistently been a respected platform for reviews and commentary on personal experience, and this year, bumped back up to contributing over half of leads in the Social Media category. Facebook, at a distant second of only 16.21% of Social Leads, essentially stayed stagnant. Instagram, now the 6th most popular social media app in the world, saw a record jump – moving from 1.65% of Social Leads to 4.66%. This likely can be contributed to more practices adopting Instagram to cater to meet Millennials and Gen X. While Twitter and YouTube are large platforms as well, their ability to deliver leads is weak. Based on this data, practices should focus their efforts on Yelp, Facebook and Instagram. One of the most interesting insights from 2018 was 78% of prospective patients who spoke with an OptiCall patient counselor booked a consultation*. 1) When patients have made the decision to call your practice, they’re also ready to take that additional step of booking a consultation. All you have to do is ensure your staff is providing the customer service that makes them feel comfortable and confident in their decision to move forward. 2.) Lead volume won’t mean a thing if there is no process in place to manage or track prospects after they’ve contacted your practice. Are you missing phone calls? Only about 15% of callers will leave a voicemail if unable to reach someone at the time of their call. If your practice is in the habit of missing calls, consider the missed opportunities at filling physician schedules. Make 2019 the year every call gets answered. Are you providing an exceptional experience? The phone call is the first impression on your practice, and putting people on hold can also be a major turn off. A survey indicated about one third of people said they’re unwilling to wait on the line, and 27.6% said they would only hold for 1 minute. It is critical you have the available staff to answer the phones and the time for them to address questions and concerns. Are you offering complimentary consultations? There are two key reasons you may not have many booked consults. One, they aren’t free, and two, you don’t ask for them. Our clients see the highest conversions when they eliminate the cost barrier by providing free consults. We also invite them – not with “Would you like to come in..” but “When would you like to come in for a free consultation?” For best phone management, staff must be proactive. *This was the combined 2018 average conversion % across all the medical specialties we work with, including Ophthalmology, Plastic Surgery, Bariatric Surgery, Stem-Cell Therapy, Cosmetic Dentistry and more. The fact that Web Leads are quickly catching up to Word of Mouth Referrals may seem surprising, but we’ve seen this trend continue over the past few years. In this day and age, when someone receives a referral from a peer, that is simply a call to perform more research on the referral – read reviews, check out their social media etc. We still make up our own minds. Now we’re seeing that tendency stretch even further, where patients are completely bypassing the referral ask and simply doing research on their own. With all the information and transparency that exists now, patients want to make their own decisions based on their individual research. So when someone is ready to contact your practice, it is with intent. There’s little to no patience involved. If a prospect spent all this time researching and settled on contacting you, they want immediate gratification. Rarely will someone fill out a generic web contact form, knowing that they have to wait 24-48 hours to receive a response. Today’s consumer is much more likely to actually place a phone call, text, or chat. The only time web forms work well is when there is a perceived immediate benefit, such as completing a self test or requesting an appointment online. So how can you better cater to your prospective patients? Web forms with INTENT – take this self test, get a free procedure quote, view customized results, get pre-approved, etc. People today have a little patience for the waiting game, and if you don’t answer the call, someone else well. While Marketing trends may go up and down, it’s clear the practices who focus on Quality Reviews, Word of Mouth Referrals and their Internet Presence will have the best chances of generating consistent lead volume. That being said, a systematic process is necessary to ensure any and every inbound call or online request make its way into your office. For over 15 years, Opticall has been the medical industry leader in providing solutions for improved customer service, engagement and conversion of initial patient contacts. Today, we are proud to offer solutions that help your practice better handle almost every form of patient communication – phone calls, text messaging, web leads, online scheduling – with industry-educated counselors and software solutions that seamlessly integrate with your practice. So Do You Want To Know How Your Practice Is Performing? Now’s the time to understand how well your practice manages inbound calls and online leads. OptiCall’s free practice assessments can give you data-driven insights that can help you course-correct performance in 2019 and beyond.